With Marvin Powell’s debut single release Buried due out on Skeleton Key Records on August 3, Getintothis’ Will Neville digs it out for a listen. 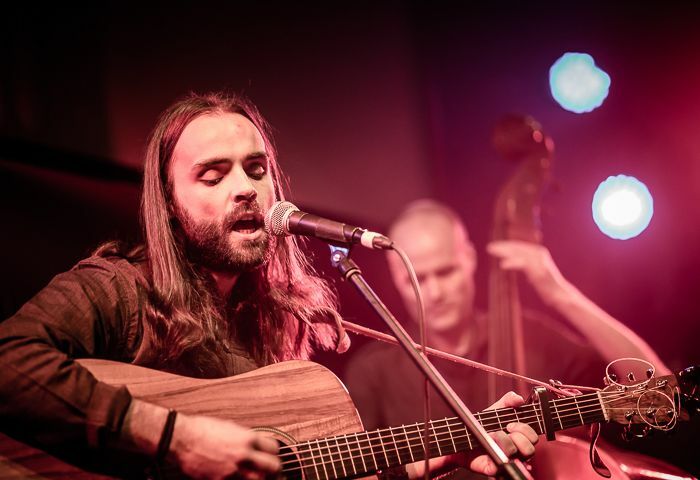 Marvin Powell has been gently impressing local gig goers over the last couple of years, with support slots for the likes of John Joseph Brill and label-mates The Sundowners, with his debut track for the Skelly brothers’ label, Skeleton Key Records, being released on August 3. The bearded, long-haired singer is backed by two of the Skellys, Alfie on 12-string guitar and Ian on percussion, with ex-Ella Guru man Bob Picken playing double bass, and keyboards from Tim Cunningham. Powell has said of the song, “It would send a shiver down the spine of the most hardened Nick Drake fan” – quite a ballsy statement. His love for the 70s troubadour shines through on Buried, as does the influence of another of his musical heroes, Joni Mitchell. The dark, illusory lyrics perfectly fit his high, delicate, but vivid vocals, with the subtle, Indian-tinged backing not getting in the way of the words or melody, as Powell’s voice is very much the focus. However, the extra instrumentation really fleshes out the sound, making for a much more engaging listen than his other, still enjoyable, songs performed solo that can be found online. There’s certainly a flavour of the acoustic side of 60s psych legends Love in his sound as well, while others have previously noted hints of Moby Grape, Bert Jansch and CSNY – heady company indeed. A much more contemporary comparison would be Chicago singer/songwriter Ryley Walker, while this writer can also hear traces of Tim Hardin, Vietman draft dodger Jesse Winchester and Californian folkie F.J. McMahon. The video highlights the psychedelic whimsy within the song, bringing to mind Strawberry Fields Forever, to add yet another heavyweight comparison to the long list already mentioned above! With a trailer like this, we can only hope for a fine debut album to follow. If you like the sound of this tune, then you can catch him at this year’s Astral Coast festival in New Brighton on Saturday 11th July.